Kate: Located in the cosmopolitan Covent Garden you will find the highly desirable L'Atelier restaurant, and elegant La Salon Bar. These credits to London are operated by the critically acclaimed French chief Joel Robuchon. The full extent of Joel Robuchon's talents have been recognised by numerous prestigious sources. In the late 1980's Joel was voted 'Chef of the Century' by Gault Millau guide. Joel's restaurants can be found across the globe, locations include New York, Paris and Tokyo. These restaurants have all been subjected to the same level of praise that Joel Robuchon himself has received. Michelin stars are awarded to restaurants, that meet the very highest standards in food, drink and ambience; Joel Robuchon's restaurants have acquired 25 of these awards. This is more then any other chief worldwide. The high standards that are met in Joel Robuchon's restaurants are extended to La Salon Bar's drinks and afternoon teas. La Salon bar is located on the top floor of L'Atelier; the bar is intimate, modern and stylish with bold red and black decor making this an ideal location for pre or after dinner drinks. The real treasure of this bar though, is the enchanted secluded outdoor terrace which can be found through the sweeping doors. Chelsie: In light of this highly extensive and indeed impressive background, imagine how delighted Kate and I were when Afternoontea.co.uk told us we would be visiting La Salon Bar to sample their 'Sweet Tea' menu!The 'Sweet Tea' menu is brand new and exclusive to La Salon Bar, and offers guests a completely different take on traditional afternoon tea. The menu was created to offer guests something really special, so naturally extensive preparation has taken place to ensure only the creme de le creme is served. La Salon Bar's new and highly talented young pastry chief called Joakim, has personally designed and created the three mouthwatering French pastries on the 'Sweet Tea Menu': 'Framboise Cuux'- a raspberry macaroon filled with pistachio cream, 'Le Dome'- a chocolate dome with coconut mousse and toffee bearovois and 'Le Citron'- a lemon and lime short bread tart. In light of London's high profile social calendar the 'Sweet Tea' menu for two comes with a jug of freshly made British Pimms to share. Wide eyed and extremely excited Kate and I decided in light of the gorgeous British weather to indulge in our 'Sweet Tea' menu on the terrace. 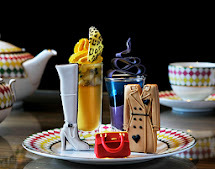 The second we stepped into La Salon Bar the service was faultless, we were shown to our table, which was immaculately presented and provided with a sufficient briefing of what the 'Sweet Tea' menu would entail. Kate: The 'Sweet Tea' began with our choice of tea (fine loose leaf) or a non alcoholic alternative including smoothies and freshly squeezed fruit juices. The menu offered us an extensive range of choice, and with every option sounding divine making my drink selection was a somewhat difficult task! After much deliberation I decided to try the 'Jasmine Pearls' tea which had a power aroma to it and strong taste. Chelsie selected a smoothie which was comprised of carrot juice, vanilla ice cream and fresh mint leaves, which was refreshing. I must mention that the drinks were beautifully presented, with my tea I was even given a delicate chocolate toffee alongside a choice of white or brown sugar and Chelsie's smoothie was garnished to perfection. The waiter delighted us after serving our first round of drinks by telling us that throughout the 'Sweet Tea' drinks are bottomless, and guests are allowed to flip between choices (hot drink or non alcoholic). In no time at all our waiter returned to our table with the first item on the 'Sweet Tea' menu a palate cleanser, 'Le Mango'- a mango coulis and mousse of mango, joconde biscuit and exotic sorbet with a delicate chocolate on top. This was absolutely divine, and incredibly refreshing with vibrant and bold colours and a taste that made you feel as if you were in the Caribbean and the mango had just been taken off the tree especially for you! This really got our taste buds going, and left us eagerly anticipating the French pastries. Chelsie: The French pastries arrived on a large, white squared plate allowing the beauty of the pastries to be maximised. It was difficult to decide which one to indulge in first, but being the massive macaroon fan that I am I decided to go with the 'Framboise Couxx'. It was love at first bite! I was actually speechless with the taste, the flavours were so intense I have honestly never tasted anything quite like it before. The whirlwind of flavour continued with 'Le Dome' and 'Le Citron', we particularly enjoyed how each pastry tasted so very different yet complimented one another perfectly. I cannot express to you all enough just how delightful sitting out in the terrace was with the sunlight pouring through enjoying heaven sent pastries.Feeling incredibly naughty after our delicious pastries we were treated to the final stage of the 'Sweet Tea' menu, the jug of British Pimms! For those viewers who have not heard of Pimms, Pimms is widely regarded as an up market traditonal British summer drink. Our jug of Pimms contained the complete works (fresh strawberries, cucumber and mint) and was incredibly refreshing. This final touch really completed our perfect 'Sweet Tea' experience.Kate and I cannot recommended the 'Sweet Tea' menu enough! If you are looking for something a little bit different, great tasting food, great service in a prime London location look no further. This would be perfect for a birthday treat, intimate meetings with friends or just because you deserve a little indulgence! The 'Sweet Tea' Menu will be available from Monday 28th July, La Salon Bar caters for every dietary requirement and is incredibly flexible however notice of this must ideally be given when booking or ASAP.